HomeWould you spend the end of the world on Ok Cupid? Would you spend the end of the world on Ok Cupid? 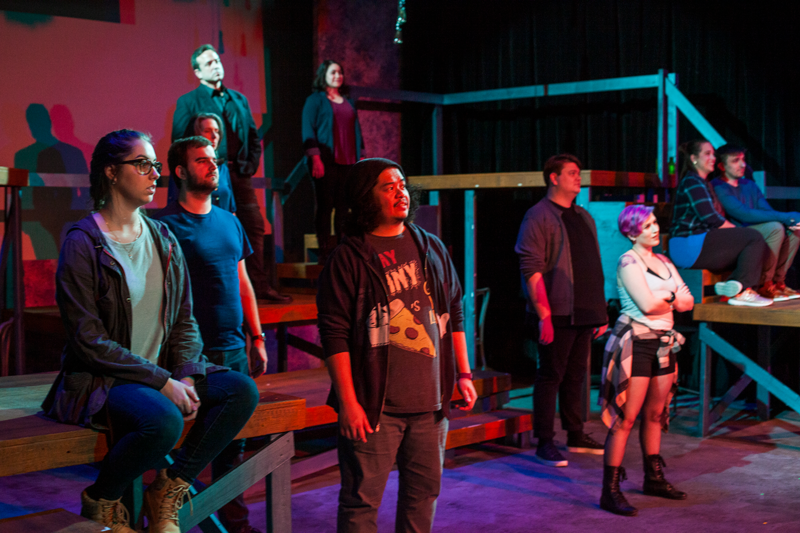 The Pear Theatre shines a unique light on social media with its current production. Since the advent of social media, the psychology world has had a field day running studies that claim to prove exposure to social media increases depression, decreases depression, makes people feel more connected, makes people feel more lonely, etc. In other words, whatever you want to prove, there’s a study out there for you. 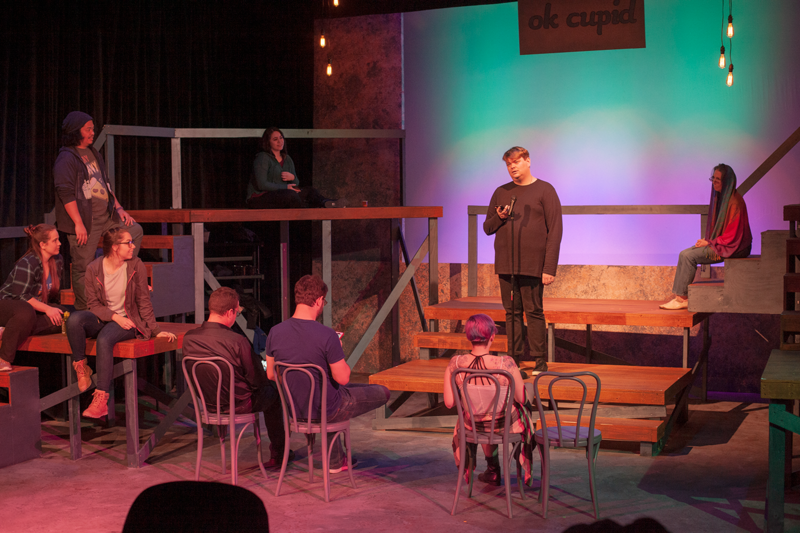 In 2016, Jeffrey Lo’s new play, Spending the End of the World on Ok Cupid, debuted at Ohlone College where it had been commissioned. The story takes an unusual look at the world of social media, and specifically an application called Ok Cupid (disclaimer from The Pear: “Spending the End of the World on Ok Cupid is not produced or endorsed by, or in any way affiliated with Match Group, LLC, or Humor Rainbow Inc., the exclusive owners of the OKCUPID® trademarks”). The premise is that a modern day prophet predicted the end of the world after he first correctly predicted that half of the world’s population would disappear in an event known as “the vanishing.” With only 12 hours left to exist, disoriented people who’ve lost loved ones and friends to the vanishing take to their phones and computers to create profiles on Ok Cupid. Each is looking to make some kind of connection one last time before whatever is going to happen, happens. Director Michael Champlin uses a cohesive ensemble to bring the story to life. His cast includes (in program order): Tasi Alabastro (Ben), Michelle Skinner (Caitlyn), Samantha Ricci (WarriorsGirl30), Michael Weiland (MsChanandlerBong), Keith Larson (Alfred Winters), Ivette Deltoro (Sage Cruz), Tyler Pardini (Leslie), Tonya Duncan (Rina), Filip Hofman (Lou), and Gwendolyne Wagner (Sarah). Several members of the cast play multiple other roles including various daters on Ok Cupid, newscasters, baristas, and other random people one might encounter on any given day. Paulino Deleal designed the unit set consisting of a network of platforms connected by staircases along stage right and stage left as well as from a larger center stage platform. 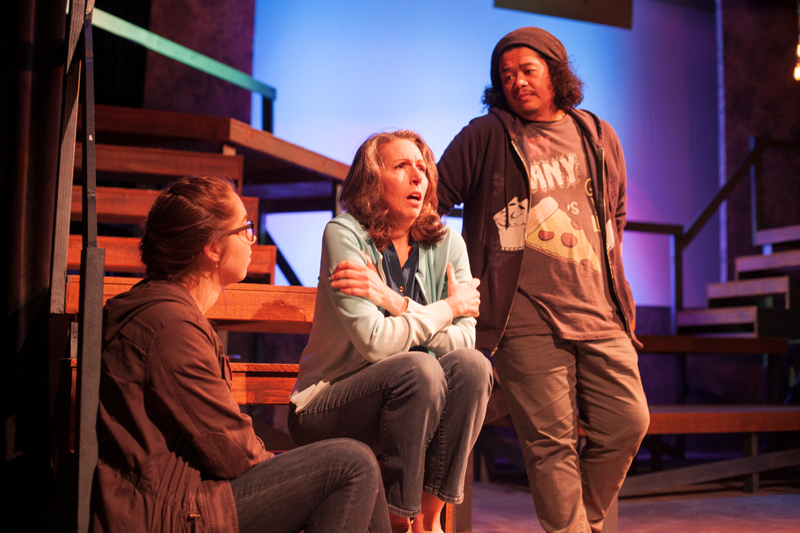 Champlin’s staging takes full advantage of the multilevel performance space, and combined with Meghan Souther’s lighting design creates an engaging, fast-moving story. The lighting adroitly focus the audience’s attention on quickly changing conversations theoretically taking place initially in cyberspace. The effect is a bit surreal, the cast executing rapid-fire exchanges without seeing the people they are addressing. Champlin also doubles as the sound designer for the production. In addition to a few beeps and buzzes, he includes a techno-pop soundtrack playing at critical moments, before the show, during intermission, and as exit music. Another very effective sound device Champlin employs is the use of voiceovers for some of Caitlyn’s inner thoughts. The story is quirky. Lo incorporates several aspects of online dating, such as how profiles are created on an “OkCupid-like” site, while focusing on how people connect both online and in real life. There is humor and urgency in the character interactions. Some of the characterizations or situations employ a fair amount of satire to emphasize the absurdity of the moment. The early rapid-fire cyberspace sequence of daters effectively reciting their profiles as they create them introduces an interesting cross-section of the site’s community. The usernames are comical, in keeping with the practices of the time. Eventually when the action splits its time between digital and corporeal interactions, the dynamics shift, and the situations become more intense. The two main couples played by Skinner and Alabastro and Ricci and Weiland are well-played. Ben and Caitlyn move from a virtual interaction to real life rather quickly, while WarriorsGirl30 and MsChanandlerBong follow a different path, and yet both couples connect deeply. Skinner shows serious vulnerability from the start as the distraught Caitlyn is clearly out of her element. She’s initially painfully shy and unsure of how to write her profile. She’s moments away from accelerating her demise, well ahead of the end of the world deadline, when Ben strikes up a cyberspace conversation with her. That initial encounter sets the tone of their fast friendship. Alabastro is high energy, bounding about the stage, capturing the uber-caffeinated state in which Ben thrives. In addition to being high energy, he’s also very caring and impulsive, living very much in the moment. As Caitlyn begins to trust Ben, Skinner carries herself with more assurance and appears stronger than she is at the outset. Weiland and Ricci are also paired nicely. The bulk of their interactions are in cyberspace, and they are separated in physical space. Weiland sits on a low step, stage left, while Ricci is on an upper platform, each staring off into the distance, phones in hand. Weiland’s character seems a little forced at first, but he loosens up as the story progresses and both actor and character relax. Ricci appears more open, within certain restrictions that her character sets for their interaction. Larson’s Winters, the prophet who has predicted the end of the world, is a bombastic know-it-all. He’s sure of himself and is very heavy-handed. He’s a significant contrast to some of the other characters that Larson plays along the way, such as a snooty barista. Hofman seems to have two modes – soft and loud. His larger role is as Lou, the son of a burger restaurant owner. He is a soft-spoken young man overshadowed by his father, Louie. As Lou, he has some depth and some personality. In his other roles as an odd dater and as a hot dog vendor, he’s single dimensional, shouting his lines. For the vendor, this works, but for the odd dater, it’s overdone. Clearly Hofman could be heard quite well in a much larger venue. Wagner’s Sarah is a connective character as her plight brings Caitlyn and Ben closer together when they come to her aid. Wagner is sympathetic, forlorn, and shows that Sarah is in desperate need of comfort after a particularly devastating loss from the vanishing. Although Pardini is credited as Leslie, their more memorable and comedic role is as one of the baristas. Both roles have appeal and draw focus as Pardini takes the spotlight as the organizer and herder of each situation at hand. Duncan’s Rina is the tough tattoo artist with a heart. She hides concern with sarcasm and snide remarks, but her body language belies a bit of her toughness. And finally, Deltoro’s Sage Cruz is very sympathetic. She’s the aggressive talk show host who, in the last hours of existence, wants to spend time with her daughter instead of making news. Deltoro huddles in a corner off her talk show set, sneaking in phone calls frantically attempting to comfort her unseen daughter. The ending isn’t quite what the audience is led to believe will happen, but it makes an impact and wraps up the story rather nicely. The performance runs about two hours including an intermission, and provides an entertaining evening’s (or afternoon’s) theater outing. It also makes us think about what is important in our lives, and it reminds us to spend some time in the present, connecting with those important to us.